Traditionally the novena to our lady started in Vailankanni. Today the healing power of our lady is widespread all over the world. 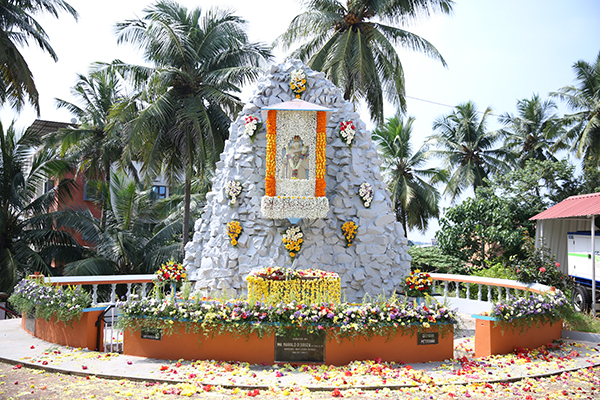 There are three major events associated with our lady of good of health in Vailankanni. The virgin Mary is said by tradition to have appeared to a shepherd boy named Tamil Krishnannesti Sankaranaranayam who offered her child milk. She is subsequently said to have appeared to and healed a crippled boy selling buttermilk. A group of Portuguese sailors attribute being saved from a violent storm to her intercession. They constructed a larger chapel at their landing spot in Vailankanni. The grotto was constructed in the church premise in 1992. Gradually the fame was silently spread due to the miraculous power of our lady. Devotees often flock to the grotto and place the intentions to our lady of good health and receive favors. On Wednesdays the special novena is prayed in honor our lady of good health. The grotto of our lady of the rosary is situated at the right side of the church extreme to the church ground. On October 7, the roman catholic church celebrates the yearly feast of our lady of the rosary. Known for several centuries by the alternate title of “our lady of victory,” the feast day takes place in honor of a 16th century naval victory which secured Europe against Turkish invasion. Pope st. Pius v attributed the victory to the intercession of the blessed virgin Mary, who was invoked on the day of the battle through a campaign to pray the rosary throughout Europe.